Location: 825 N. Carpenter St., Chicago, Illinois 60642-5499. 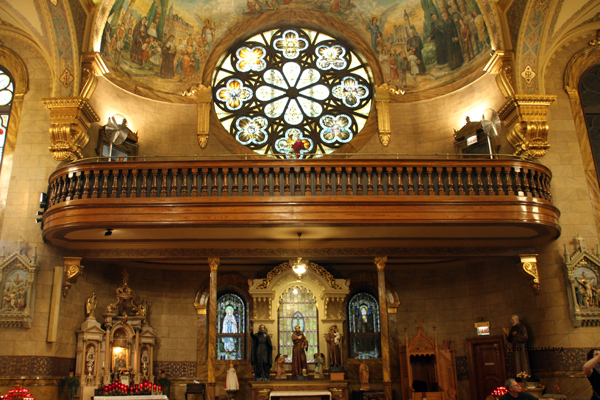 Founded in 1893, to relieve overcrowding at St. Stanislaus Kostka Church on Noble St., the oldest Polish parish in Chicago. The structure construction work began in 1893 and was completed by 1898. 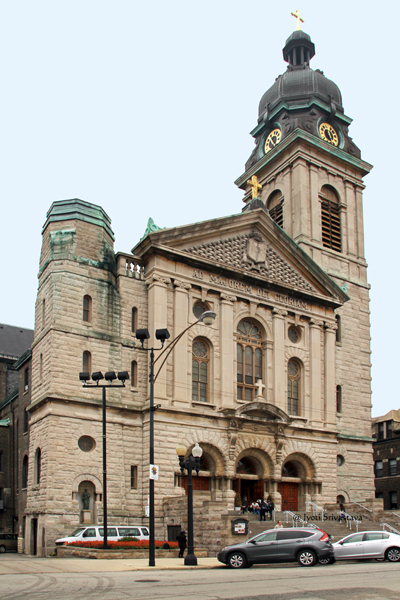 St. John Cantius Parish is a historic church of the Roman Catholic Archdiocese of Chicago. It was founded by Polish immigrants at the end of the nineteenth century. Today, the parish today represents a broad cross-section of every ethnic, socio-economic and age group. It is known for its solemn liturgies and rich program of sacred art and music. The interior style is defined as baroque. Its unique interior has remained intact for more than a century, and is reminiscent of the sumptuous art and architecture of 18th century Kraków. In 2013, St. John’s completed an ambitious restoration project, returning the lavish interior to its original splendor. ‘Polish Cathedral style’ of churches are characterized by opulence and grand scale. 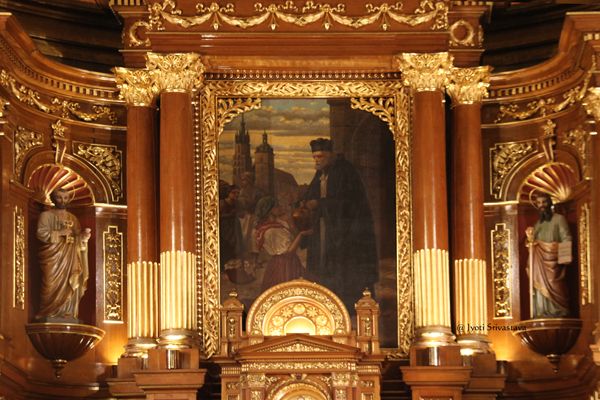 Of all the Polish Cathedral style churches in Chicago, St. John Cantius stands closest to downtown. The imposing 130 feet tower is readily seen from the nearby Kennedy Expressway and is a familiar landmark in Chicago’s West Town neighborhood. 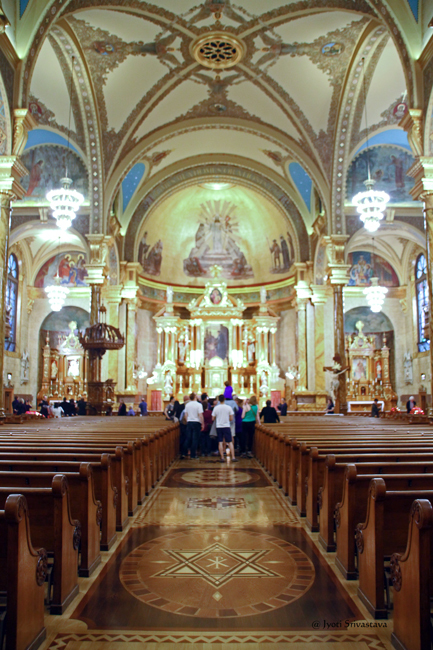 Apart from St. John Cantius, many monumental Polish churches visible from the Kennedy Expressway, including St. Stanislaus Kostka Church, Basilica of St. Hyacinth, St. Mary of the Angels, St. Wenceslaus Church and St. Hedwig’s. In 1893, 20 houses in the immediate area of Chicago Ave. and Carpenter St. had to be demolished to make way for the new Catholic Church. Construction work began in 1893 and was completed by 1898. 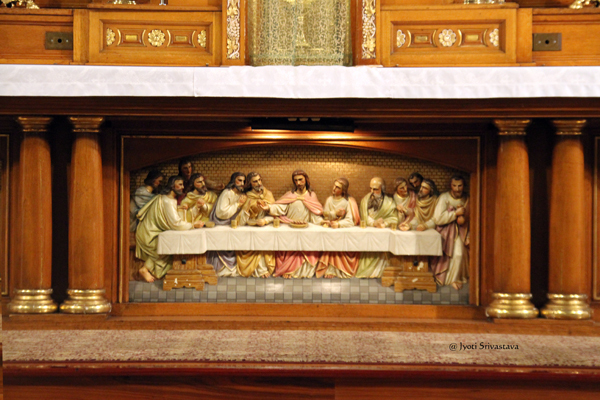 St. John Cantius Parish, Chicago. The Church building’s design is by Adolphus Druiding – a German-born American architect – best known for his work in creating Roman Catholic churches, schools, rectories and convents. 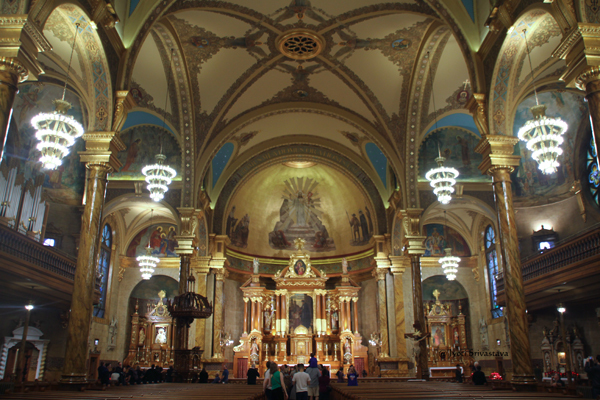 Druiding’s work along with that of fellow German immigrant Franz Georg Himpler makes up the largest body of German Catholic architecture in the United States between the end of the Civil War and 1900. The building has a façade of rusticated stone in the High Renaissance style with empahsis on columns, domes, arches and niches. At the very top is a monumental pediment decorated with the coat of arms of Poland’s failed January Uprising, under which is found the inscription “Boże Zbaw Polskę” [God Save Poland, in Polish]. Just below this on the entablature, is the Latin inscription “Ad maiorem Dei Gloriam”, a text which proclaims that this building is for the Greater Glory of God, a Jesuit motto popular in many churches built around the start of the 20th century. Three Romanesque portals set in receding arches lead into the interior. 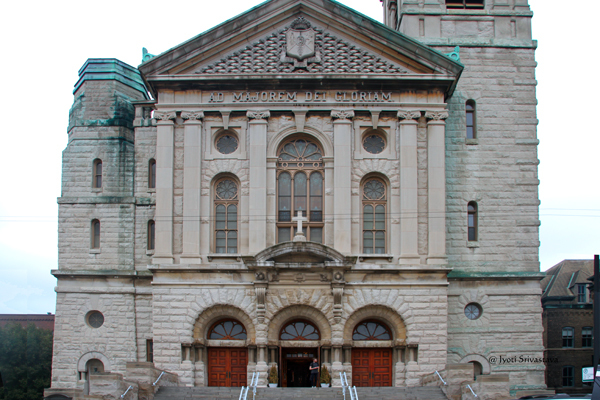 Like St. Michael’s, the entrance is flanked by two asymmetrical towers topped with copper cupolas, 200 feet and 100 feet in height, styled after St. Mary’s Basilica in Kraków. The whole structure is 230 feet long and 107 feet wide and can easily accommodate 2,000 people. 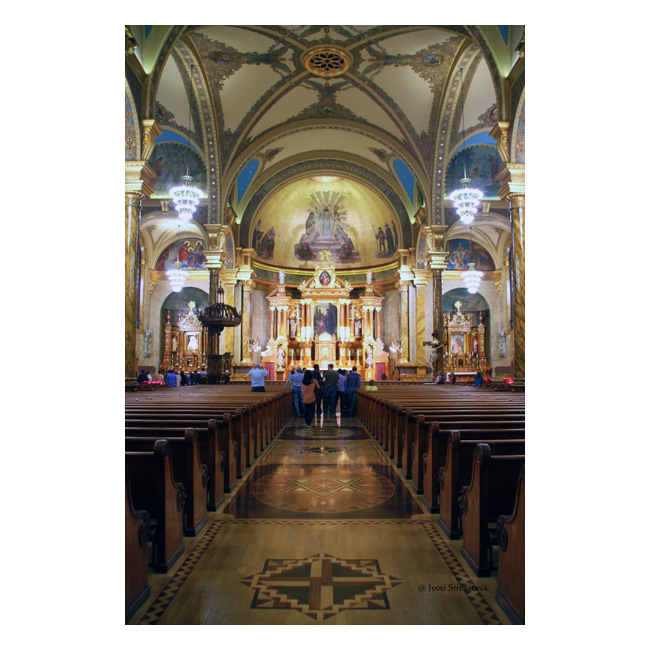 Baroque interior / St. John Cantius Parish, Chicago. – The interior style is “Baroque”. The grandeur and exuberance in architecture, sculpture and painting can be instantly felt as one enters the church. – There are stone columns supporting the vault. 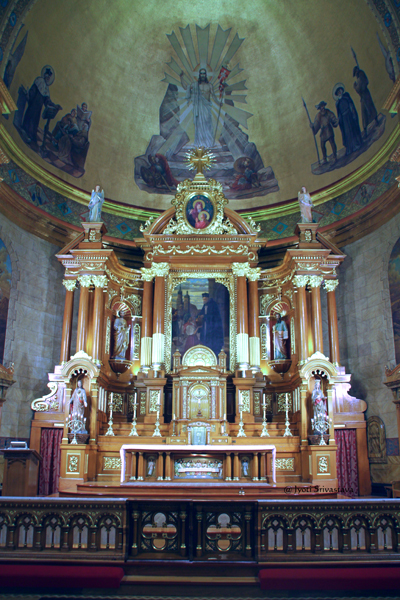 – The church’s main altar, as well as its matching two side altars reputedly originate from the 1893 Columbian Exposition. – In 1903, the interior was painted for the first time. It was then that all the plaster and wood ornament were added and the church received the character it has today. 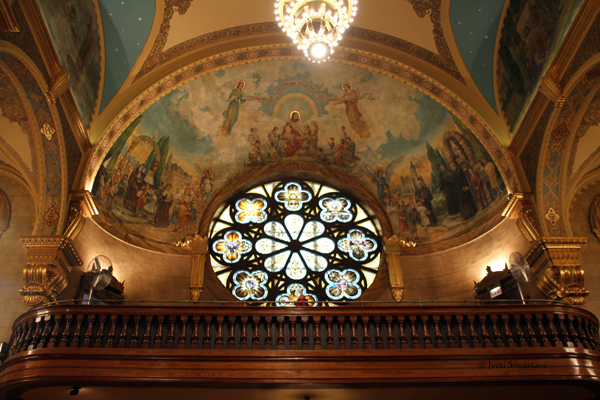 – The stained glass windows were made by Gawin Co. of Milwaukee. – In 1920, the interior murals were painted by Lesiewicz. 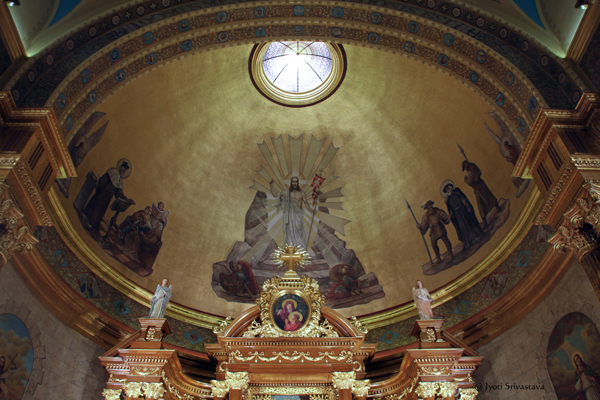 In addition to religious scenes, such as the Resurrection under the main altar, the artist decorated the side walls with paintings of Polish patron saints. 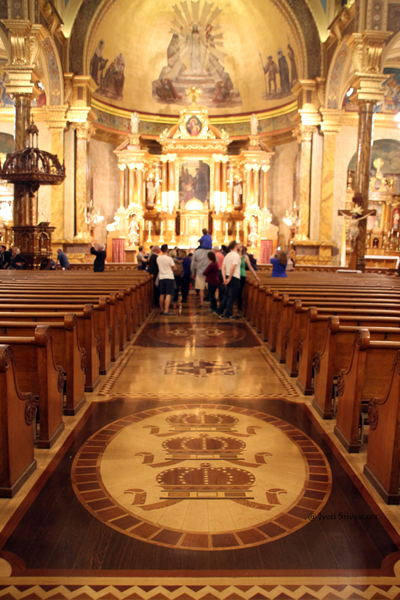 – In 1997, new inlaid hardwood floor was installed in St. John Cantius Church. It was designed by Jed Gibbons. – As mentioned earlier, in 2013, the church completed an ambitious restoration project, returning the lavish interior to its original splendor. 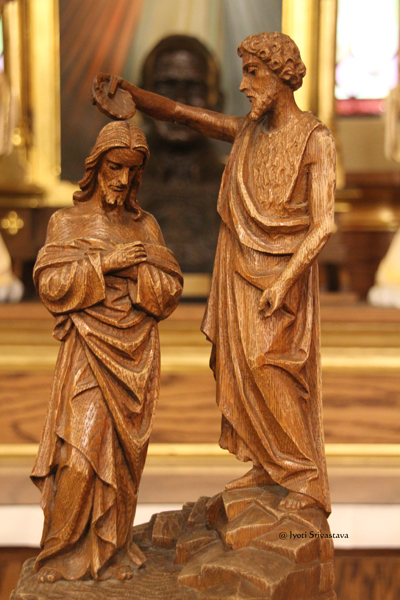 This restoration includes a preservation of the artistic patrimony of the Church, replete with exemplary vestments, sacred vessels, and art works. 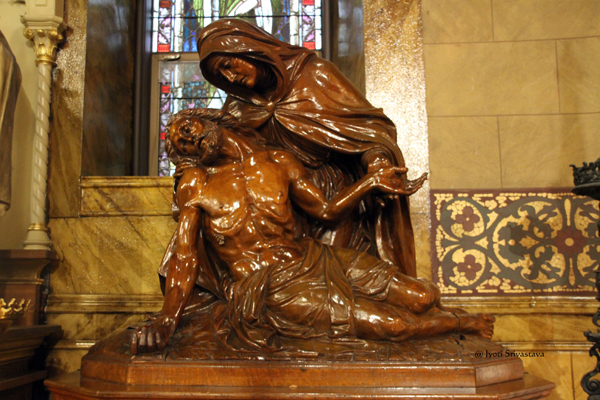 But this mission is not only concerned about preserving artistic works of the past, but also of the liturgy itself. Following the dictates of the Second Vatican Council, the parish has preserved and given place of pride to the traditional music of the Church. 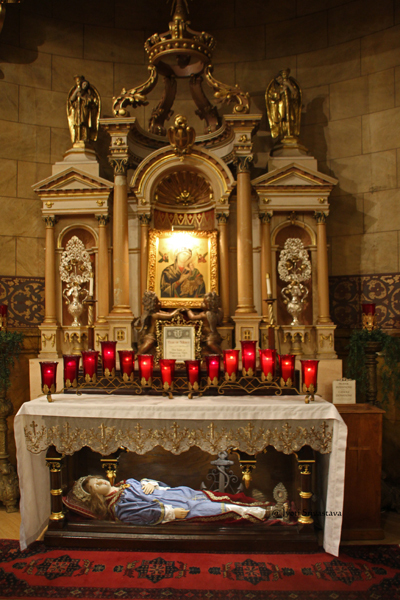 The parish also maintains the customs and traditions which relate to its Polish heritage. 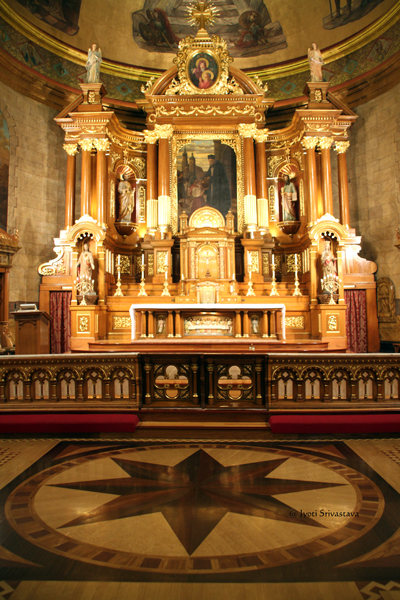 Main altar / St. John Cantius Parish, Chicago. 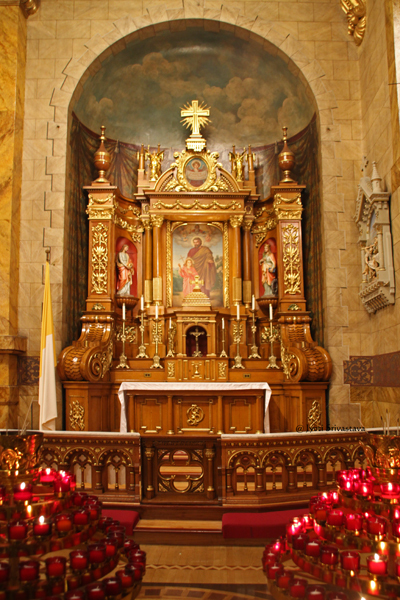 Left side altar / St. John Cantius Parish, Chicago. 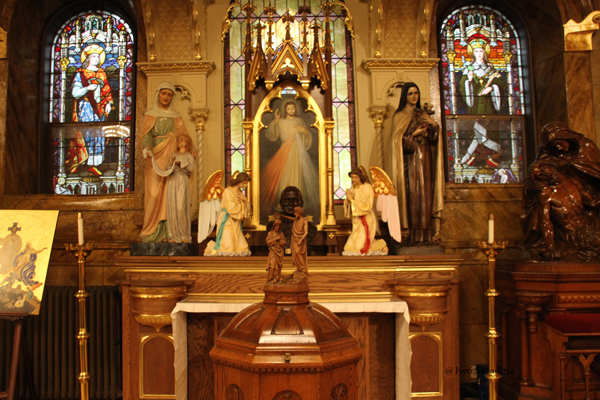 Left side altar – Our Lady of Częstochowa—the Black Madonna / St. John Cantius Parish, Chicago. 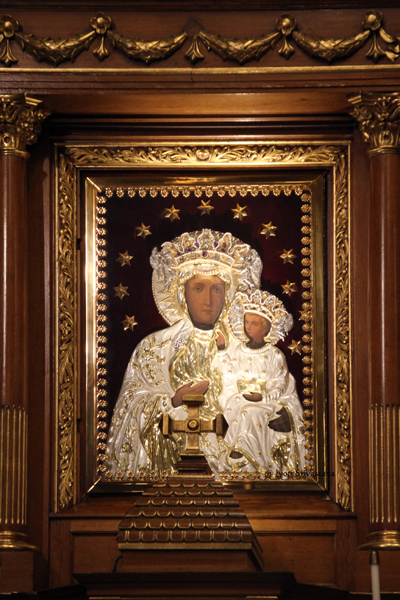 Our Lady of Częstochowa — the Black Madonna — is honored by Polish people everywhere. 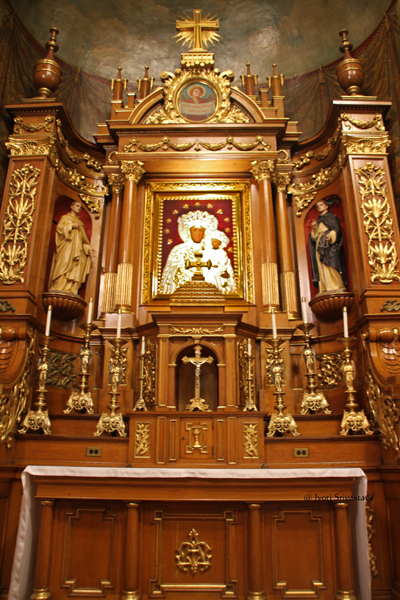 Right side altar / St. John Cantius Parish, Chicago. Star — Christ is the Light of the World. This floor, which is reputedly the only of its kind in the United States, has already won three national awards. 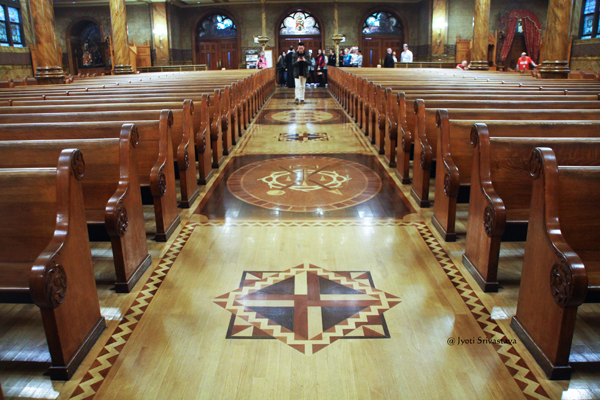 Inlaid hardwood floor / St. John Cantius Parish, Chicago. 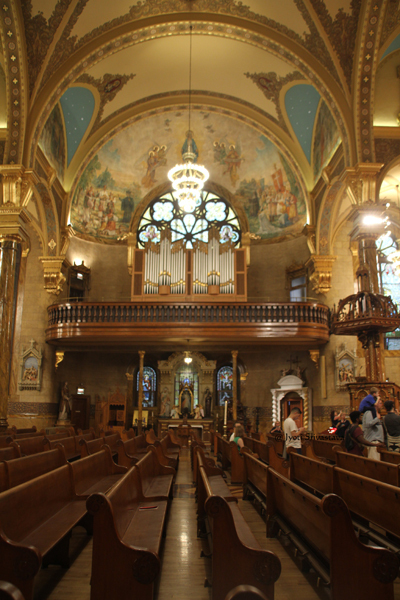 Left transept / St. John Cantius Parish, Chicago. 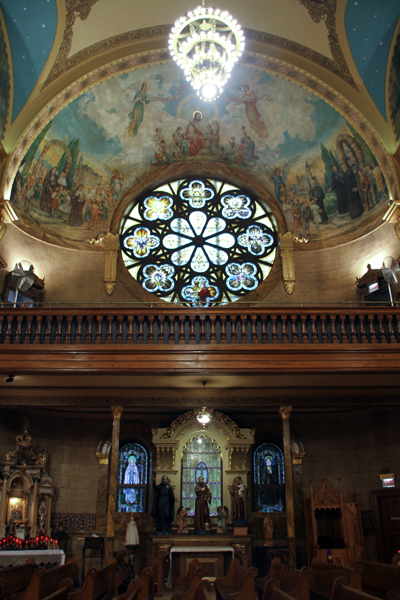 Right transept / St. John Cantius Parish, Chicago. 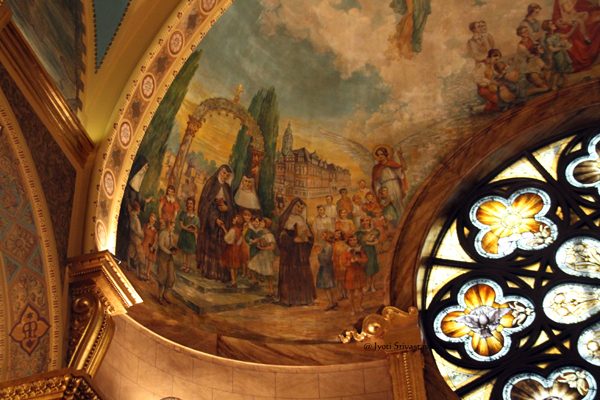 Right transept – mural / St. John Cantius Parish, Chicago. 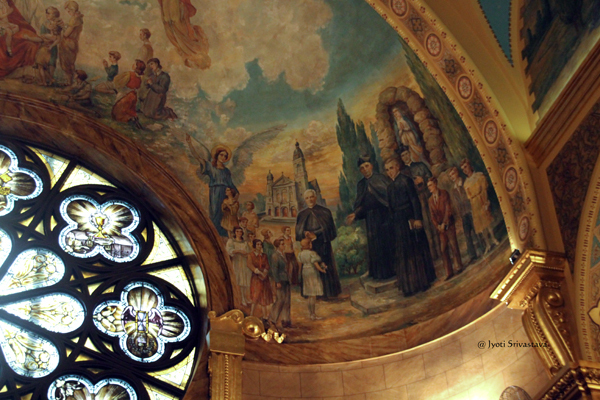 Right transept – mural detail /St. 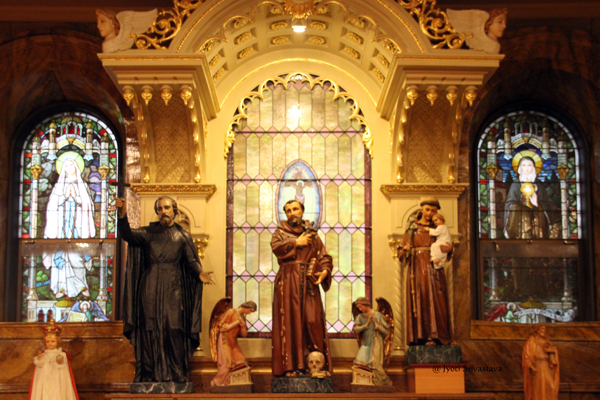 John Cantius Parish, Chicago. 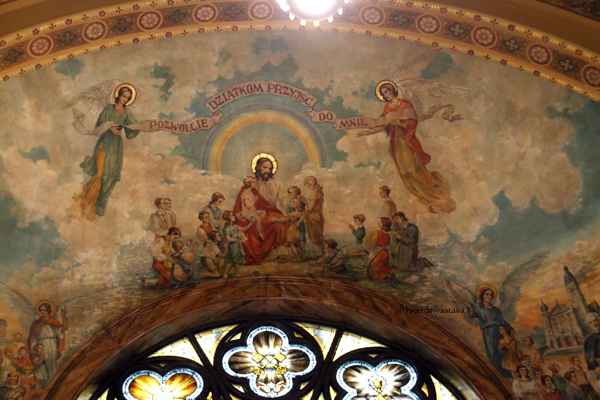 Right transept – mural detail / St. John Cantius Parish, Chicago.